Disney, here is “Jeweled Octopus”. Marine cephalopods – octopus, squid, cuttlefish, etc. are some of my favourite creatures, and I think they are worthy of some fine jewelry now and then! The original painting herself was sold a the show, Limited Edition Canvases are available from Pop Gallery (and Hoypoloi Galleries), other prints & merchandise are available online. Limited Edition Canvas prints are exclusive to Pop Gallery and the Hoypoloi Galleries. You can pick yours out in person, or they are happy to ship worldwide- just call them at 407-827-8200 or email them at [email protected]om – the “Jeweled Octopus” Limited Edition Canvases are a big 16″x20″ gallery size, deep cradled/gallery wrapped edges, hand embellished by me in acrylic paints, signed & numbered out of 42 ever made, and at $515 each they are truly the next best thing to owning the original. Big Limited Edition Hand Embellished Canvas prints are Pop Gallery Exclusives and are the big gallery oversize format – 30″ wide by 20″, hand accented by me in acrylic paints, signed & numbered out of 42, and are $995. 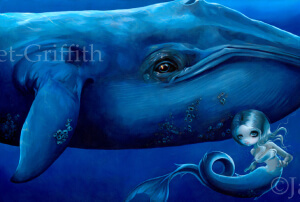 Available only from Pop Gallery at Downtown Disney in Florida (also upon request at Hoypoloi Galleries) – they will ship WORLDWIDE – you can email them at [email protected] by calling them at 407-827-8200 and letting them you’d like like to place a “special order” for Jasmine’s “Big Blue Whale”. Myths & Mermaids show is TONIGHT! 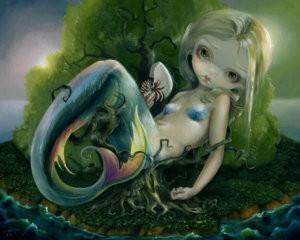 My “Myths & Mermaids” solo show opens here in Florida TONIGHT at 7pm at Pop Gallery at Downtown Disney. I’ll be there from 7pm-10pm tonight, and again tomorrow from 5pm-8pm. I will be debuting many new original paintings, we’ll have fun stuff to do & I’ll be signing autographs, free postcard prints, & more. Come say hi! All ages are welcome, and it’s a FREE event, free parking, no park tickets needed. Pop Gallery is at Downtown Disney’s West Side, right over by Cirque du Soleil and the AMC Theatres, across from House of Blues. Click HERE for the Event Page to see more details. Work in progress for a big blue whale painting…..
A work-in-progress for an enormous painting of an enormous great blue whale (with a mermaid, of course). Another one of the paintings that will be debuting at my Myths and Mermaids show (Dec. 14-15 at Pop Gallery at Downtown Disney at Disney World here in Florida). 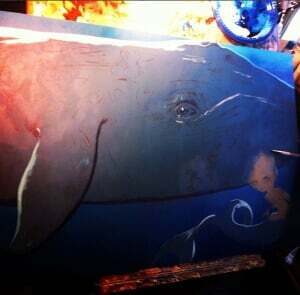 Mostly it looks pretty much all blue right now as I’m still working on the background and the cooler shadow & highlight tones, it’s going to have a lot of blue as it’s a blue whale in a blue ocean, hehe. This piece will be priced around $9200 and will come in an ornate antiqued silver frame measuring about 43″ wide by 32″ high. Prints & Lt. Ed. Canvases will also be available at and after the event. Be sure to get on the “Jasmine VIP email list” to be notified when this original painting (and other new originals available from the Myths and Mermaids show!) is available to purchase. You can join the list by calling Pop Gallery at 407-827-8200 or emailing [email protected] and simply ask to be on the VIP list for Jasmine Becket-Griffith Originals . While Pop Gallery does not pre-sell or reserve unfinished artworks, all available originals will be announced via email after completion first to the “Jasmine VIP email list” and then sold on a first-come, first-served basis. You must be on this Jasmine VIP email list if you would like to receive purchase information prior to the general public release before the show. 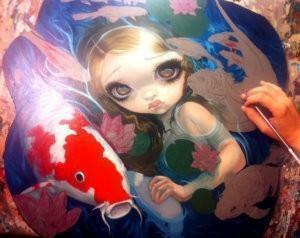 A work-in-progress for “Swimming with Koi” – turning out really well so far. Another one of the paintings that will be debuting at my Myths and Mermaids show (Dec. 14-15 at Pop Gallery at Downtown Disney at Disney World here in Florida). I’ve got the central mermaid character just about finished and now I’m painting in a bunch of bright coloured koi fish surrounding her. This piece will be priced around $6400 and will come in a very unique & oddly shaped antique wooden frame that really sets off the strange shape of this painting. Prints & Lt. Ed. Canvases will also be available at and after the event. Be sure to get on the “Jasmine VIP email list” to be notified when this original painting (and other new originals available from the Myths and Mermaids show!) is available to purchase. You can join the list by calling Pop Gallery at 407-827-8200 or emailing [email protected] and simply ask to be on the VIP list for Jasmine Becket-Griffith Originals . While Pop Gallery does not pre-sell or reserve unfinished artworks, all available originals will be announced via email after completion first to the “Jasmine VIP email list” and then sold on a first-come, first-served basis. You must be on this Jasmine VIP email list if you would like to receive purchase information prior to the general public release before the show.